This book is an invitation. Your Father is calling you to know Him in life-changing ways. You were created for relationship and fellowship. Your heart cannot be satisfied until if finds its rest in the Father’s love. 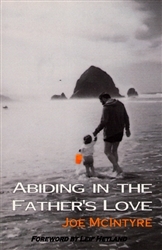 Satan has worked in all of our lives to distort the image of fatherhood. As long as we feel alienated from our Father’s presence, our Christianity will be us working to appease a god who can never be fully pleased. But when we see the truth about our loving Father and enter into a deep, rich fellowship with Him, life takes on whole new meaning and significance. This is why you were created and what Father longs to bring you into. This book points to the riches of grace revealed in what Christ has done for us so that we might enjoy intimacy with our Father God. Joe McIntyre has one of the clearest messages on the Father’s heart of anyone I know. I have been greatly impacted through his ministry, both in his preaching and his writing. And now he gives us Abiding in the Father’s Love. This is a wonderful book filled with insights and grace that are sure to powerfully impact all who read it.